Samsung introduced a new Always On Display with the Samsung Galaxy Note7 including enhanced features designed to help users get more out of their smartphone, even when the screen is off. The Always On Display not only makes a strong first impression, but is also an element of design that differentiates the Samsung Galaxy Note7 from other devices on the market. From the Screen off memo that all but replaces the ubiquitous sticky note, to brand new customisation options, the new Always On Display keeps users on track in an always-on world. With the new Screen off memo function, users do not need to launch the memo app to jot down a reminder or a to-do list. 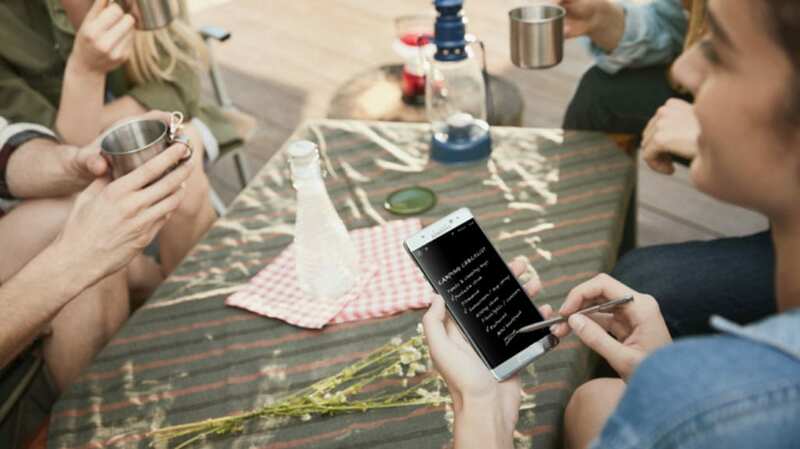 Instead, they can conveniently use the phone’s S Pen to write a note directly on the Samsung Galaxy Note7’s off screen. Once a memo has been jotted down, it will remain visible on the Always On Display for an hour to remind users of important events, similar to a sticky note. Memos can also be pinned to the Always On Display so users can check them at a later time by simply double tapping the Memo icon. Users can also store these memos in the Samsung Notes app directly from the Always On Display. When the Always On Display made its debut with the Samsung Galaxy S7 and S7 edge earlier this year, it gave users continuous access to important information such as the time, date and missed calls. But with the Samsung Galaxy Note7, Samsung is taking things even further by expanding the amount of information that can be displayed. Now, on top of missed calls and messages, users can also check their calendar for events and view notifications from various apps. For example, they can get song information from music apps. In addition, with the new Direct Access feature, users can easily react to notifications and automatically launch an app or the music player by simply double tapping the notification that is displayed. This makes it possible for users to quickly reply to messages, edit calendar information or pause a song. Direct Access not only adds convenience, it also saves users valuable time. In addition to offering superior convenience, the Always On Display provides a variety of personalisation options, making the Samsung Galaxy Note7 as unique as its user. Users can customise the Always On Display from the Settings menu by selecting from a wide array of clock faces and modes, as well as calendars and images. Users can select their favourite image from the Internet or their smartphone Gallery as the Always On Display background. Users can also edit the font style and colour, and even set their own signature. Although the Always On Display continuously displays key information, it is power efficient, using less than 1 percent of battery per hour*. With the Super AMOLED display on the Samsung Galaxy Note7, the black pixels completely shut off, enabling the Always On Display capability. Also, Samsung was able to decrease the power consumption of the display’s related components, such as the Display Driver IC (DDI), which consumes the most power, the Application Processor (AP) and other various sensors. To further improve performance of the DDI, Samsung separated the power usage process into two modes – the normal mode and Always On Display mode – by applying the Smart Power Saving hardware algorithm, reducing power consumption even when the display is in sleep mode. In another effort to minimise power waste, Samsung integrated technology that enables users to turn the Always On Display feature on or off. The Samsung Galaxy Note7’s proximity, RGB light sensors and its accelerometer determine if the Always On Display should be on or off, depending on the device’s external environment. For instance, if the Samsung Galaxy Note7 senses that the device is in a pocket or bag, the Always On Display will turn off. In addition, the Always On Display automatically turns off when the phone’s battery goes below 5 percent, or when the user activates the Night Clock, which is located on the device’s edge display. *This may differ based on the user’s usage pattern.